As per blogs and best practices of Sitecore, its advised that fast queries should be avoided. The reason for that is fast queries will directly access the DB and fetch the results which causes overhead in performance if too many requests comes, mainly in production. Normal Sitecore queries will take from indexes and have cache mechanism implemented. So if I fast query an item with 100 children will all those come in to memory without paging or caching? If normal queries are fetching from indexes where these indexes are stored and what indexing strategy they are following? No - if you fast query a single item, you will get a single item. If your fast query adds children or all descendants you will get what you asked for. This is the same whether you do a standard or fast query. Normal queries are not fetching from an index, they are still using the database, but they are put through layers of caching. On a cold start, fast query might be faster, but after the first call, a normal query (unless a crazy one) can be faster because of the caching. The third option to get data out is the content search API. This does use either a Lucene, Solr or Azure Search index to get the data. It is very fast and the best method to use to get data unless you know the Id of an item. @Hishaam's post covers the typical strategies for updating those indexes. If you use fast query, it will bypass all those levels of cache and hit the database directly because Sitecore Fast Query converts all the query conditions into SQL statements. Fast query is faster on the first call than Sitecore query. But the next time, it will be slower than Sitecore query because it will need to hit the database again while Sitecore query will hit the cache. 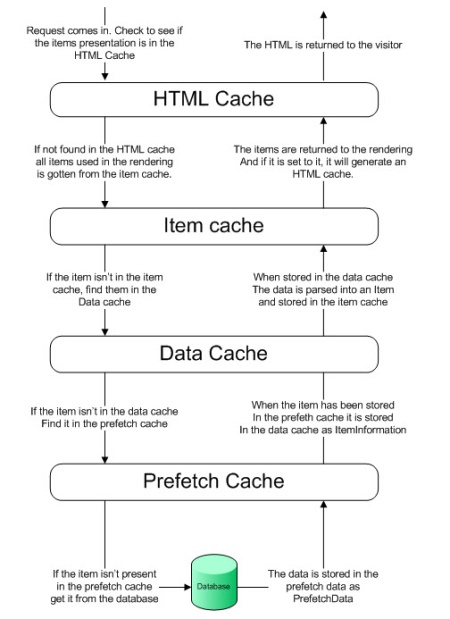 Indexes are different from cache. Sitecore has 2 types of index provider: Lucene and Solr. When you query the indexes, it will not query the database but instead the lucene file indexes which are stored on the server or the Solr cores from the solr server. The index strategies differ for each database and requirements. We tend to use the SyncMaster strategy because when content author performs changes on the Content Editor, the master index will get updated once the item is saved. For web indexes, normally, we tend to use onPublishEndAsync. This stratgey will trigger the rebuild of indexes once a publish has completed. Not the answer you're looking for? Browse other questions tagged sitecore-query index or ask your own question.